Plains, particularly depositional plains, have always been the center of attraction for settlement as they are very supportive of farming practices and other economic activities. Read about agricultural, demographic, industrial, cultural, historical and political significance of the great north Indian plains. Plains, particularly depositional plains, have always been the center of attraction for settlement as they are very supportive of farming practices and other economic activities. We can see all kind of farming practices in these plains - commercial farming, subsistence farming, cattle rearing, animal husbandry. The Great North Indian Plain is proving to be the greenery for India. It is also the Food Basket of India as what we are growing in these plains because of which we are able to feed 1.2 billion people. Punjab plain definitely growing surplus. Even the Rohilkhand plain situated in these plains grow surplus. Gangetic plains grow enough for 40% population of India as 40% people are settled in the great north Indian plains. India accounts for only 2.5% of world area yet it is able to sustain 17.5% of world population primarily because of the intensive farming which is done in the great north Indian plain. 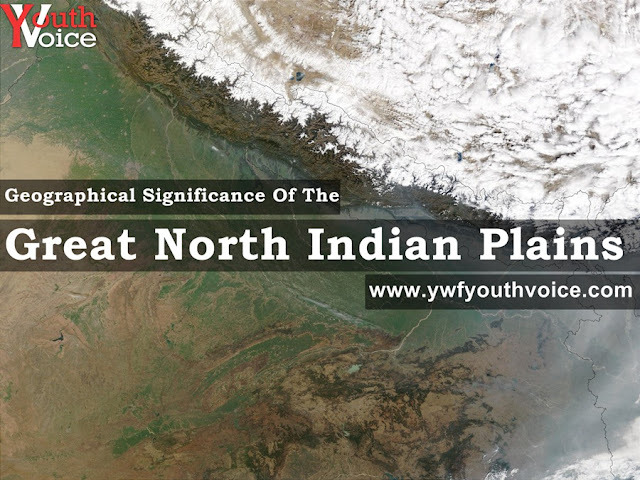 Most part of great north indian plain is known for very high population density. Factors which attribute to this high density are fertility of soil, availability of water, suitability of climate and topography supportive of compact settlement. Many industries, driven by demand and availability of labour, are located in Great North Indian Plains. The geography permits development of all four means of transport. Very deep penetration of Indian railways and very dense network of roadways. Civil navigation is very developed. Navigable rivers permits waterways. Most of the civilization began from the river valleys including the Indus Valley civilization which started near these great north Indian plains. Many cities with long histories are situated in these plains such as Patliputra, Patna, Ayodhya, Varanasi etc. India is the largest democarcy of the world and democracy is considered to be the game of numbers. There is high concentration of population in gangetic plains and other parts of great north Indian plains so it have significant influence on governance and policies of the country. Most of the Prime Ministers are from these plains, directly or indirectly, for example, Nehru, Rajiv Gandhi, Indira Gandhi, Atal Bihari Vajayapee and many more. Even the present Prime Minister Narender Modi conducted election from Varanasi. Therefore we can say that no other physio-graphic unit in the world influences the geography, economy and politics of a country the way the Great North Indian Plain does for India.